What’s Love (of Sodium) Got To Do With It? And How MSG Can Keep the Love Alive! When you conjure up your favorite meal, be it a holiday dish or an entrée that Mom used to only serve on Sunday, the first thing that probably comes to mind is how good it tastes. Sure, the aroma of a simmering casserole may waft through the house (and your mind), but it is how a food tastes that makes it so yummy. One of the basic taste sensations learned in grade school is “salty.” Indeed, salt works on our taste buds in a very specific way, helping to define how something tastes, a sensation so critical to the palatability of many foods. So why all the talk about salt in our diets? The discussion about salt intake is everywhere, especially on the Internet and TV news stations. We continue to hear the unyielding recommendations from leading health professional organizations to cut down on how much salt we consume. However, what these authorities are really talking about is the sodium in our diets, not just the salt. Salt contains sodium, but it also contains chlorine, so only part of the mass of salt is sodium. According to the U.S. Dietary Guidelines for Americans issued in 2010, we need to reduce the amount of sodium we are eating. From a taste perspective, when reducing the use of salt (thus reducing sodium); often times a food can taste bland and downright unpalatable. That is where the use of monosodium glutamate (MSG) comes in, which can be used to partially replace that extra amount of salt needed to enhance flavor. MSG, the sodium salt of the common amino acid glutamic acid, actually contains one third less sodium than table salt. In fact, studies have shown that by increasing the level of glutamate and decreasing the level of salt, sodium content can be lowered by up to 40 percent, with no loss in flavor and enjoyment. 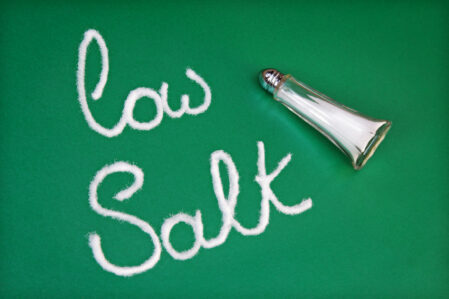 Moreover, MSG represents a minor contribution to the overall sodium level of a typical diet. By way of comparison, MSG contains about 12 percent sodium while table salt contains 39 percent sodium. Even when monosodium glutamate is used in combination with a small amount of table salt, it can reduce the total sodium in a recipe by 20 to 40 percent (while still maintaining the desired flavor). So, the next time you decide to forego the salt shaker with thoughts of improving your health, consider sprinkling on some MSG instead. The end result will be a flavorful food with less sodium than if you had used table salt. MY FOOD FOR THOUGHT: I personally use MSG to add much-needed flavor to those easy-to-prepare frozen “healthy” meals. Why? They are a bit bland in my opinion. Sure, it is a good thing that Food and Drug Administration guidelines require that any food termed “healthy” contain a specific, limited amount of sodium. But in my kitchen, I have the option of enjoying the meal more by opting for a dash of MSG to bump up the flavor profile. 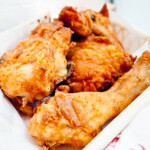 For lovers of that oh-so-famous “colonel’s fried chicken,” here is a fried-baked version that is a potluck dinner fave! Special thanks to AllRecipes.com. Previous PostGOOD News about MSG (Monosodium Glutamate)? Believe It.